Starring: Cary Grant; Ingrid Bergman; Claude Rains; Madame Kostantin. A love movie in disguise. 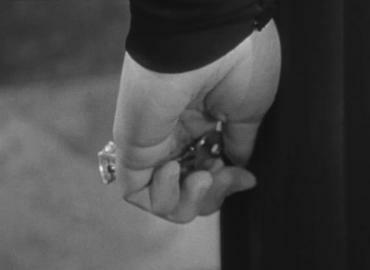 In 1944, in the midst of WWII, David O. Selznick had the idea to assign to Alfred Hitchcock, the British director he had signed to a seven-year contract in 1939 and took to Hollywood, the project for a new spy movie based on a short story by John Tainter Foote, The Song of the Flame (some sources title it The Song of the Dragon), published in The Saturday Evening Post in 1921. Hitchcock and the screenwriter Ben Hecht decided to retain from it the only thing that in fact grabbed the director’s attention, the story of a girl who has to go to bed with a spy to get important information, adding as a Mac Guffin (the plot device) some bottle of wine containing some sort of uranium sand kept in a big house wine cellar, enough to put together one of the most famous Hitchcock movie that will be released a year after the end of the war, in 1946: Notorious. According to Hitchcok, as you can read in the Francois Truffaut’s book-length interview Truffaut/Hitchcock, the idea to use as a Mac Guffin some apparently innocuous bottle of wine containing a sort of uranium sand kept in Sebastian House cellar, had been suggested to him a year before the atomic bombing of Hiroshima by a friend remarkably well-informed on every possible use of that sort of material, but was in fact another idea, to go with Ben Hecht to the California Institute of Technology to learn something more about atomic bombs, that caused to the director some trouble with the F.B.I. 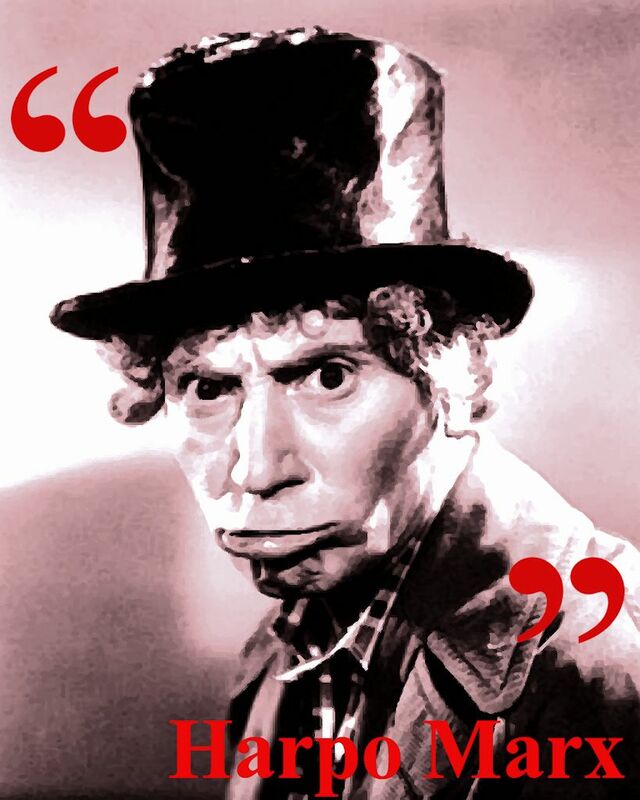 (in fact it was decidedly a suspect behaviour in war times) while the fact that Selznick judged an unlikely event the existence of an atomic bomb, caused many discussions embittering his working relationship with the producer who, always according to Hitchcock, a couple of week after the last dispute sold the entire project to R.K.O. retaining the 50% of the final profits (in fact at that time Selznick’s attention was almost completely absorbed in the production of Duel in the Sun and the producer had little interest in a film made by a director he could not control the way he was used to do with almost everything). Ironically, that troublesome Mac Guffin had no importance at all to Hitchcock (after all that’s what a good Mac Guffin should be, irrelevant): Notorious was, above all, a very complicated love story. In fact the real plot device here ain’t uranium, but love. When Alicia understands what her mission is about, she accepts to go ahead not because she feels it is something due to her Country, but because she loves Devlin. She could do everything for him, because she needs to prove him she ain’t the misfit he knew in Miami, because she wants his approval and because she’s desperately waiting for a sign from him showing that what she has done it’s enough and he has finally understood that she is a good girl. But Devlin has no intention to intervene, not even when Sebastian proposes her. He’d rather be blinded by his prejudices than admit he’s in love with the little drunkard daughter of a Nazi, because nothing can stop his mission: he’s a tough guy, he never trembles and never fails and even when he has to do something he doesn’t like (and there’s something he doesn’t like in his mission if he quarrels with his superior officer when he questions Alicia’s morality), he does it just the same. Incredibly enough, especially considering that the movie has been written during WWII to be released in August 1946, the most tragic character in Notorious’ love triangle is not Alicia, but Alex Sebastian. If he wasn’t a Nazi you could almost feel sorry for him. 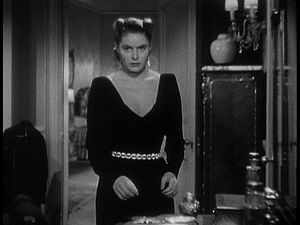 He is the typical middle-aged man, not very attractive and also a bit short (the fact that Rains was shorter than Bergman caused some “technical” trouble during the shooting), who falls in love with a young, pretty and tall girl and deceives himself thinking the girl is madly in love too. What’s more, the poor man lives with his intrusive, oppressive and possessive mother who considers him a sort of stupid child and acts like a real witch, an attitude that will come in handy when finally poor Alex discovers he married a spy. In fact she will be cold enough (“we are protected by the enormity of your stupidity” she kindly says to her dumb son) to prepare a plot to kill her, an act that finally will restore Alex’s dignity (at least some sort of villain’s dignity) giving us the opportunity to hate him enough to rejoice for the tragic end he will certainly meet behind the close door after the end of the film (or find it morally justifiable). If you’re still asking yourself why you should watch an old black and white picture released in 1946, well you must know that, although not included in the “BFI top 50 Greates Films of All Time” list published last year (#1 is Hitchcock’s Vertigo), Notorious is #1 in “My favourite Hitchcock’s films list” and in “My favourite films of all time” list and, anyway, is one of those movies you should have seen at least once in your life. Mata Hari – USA 1931 Directed by: George Fitzmaurice. Starring: Greta Garbo; Ramon Novarro; Lionel Barrymore. Gilda – USA 1946 Directed by: Charles Vidor. Starring: Rita Hayworth; Glenn Ford; George Macready; Joseph Calleia. 13 Rue Madeleine – USA 1947 Directed by: Henry Hathaway. Starring: James Cagney; Annabella; Richard Conte. The Third Man – UK 1949 Directed by: Carol Reed. Starring: Joseph Cotten; Alida Valli; Trevor Howard; Orson Welles. Indiscreet – USA 1958 Directed by: Stanley Donen. 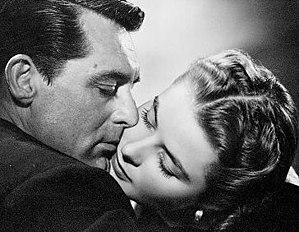 Starring: Ingrid Bergman; Cary Grant; Cecil Parker; Phyllis Calvert. North by Northwest – USA 1959 Directed by: Alfred Hitchcock. Starring: Cary Grant; Eva Marie Saint; James Mason; Jessie Royce Landis; Martin Landau. Torn Curtain – USA 1966 Directed by: Alfred Hitchcock. Starring: Paul Newman; Julie Andrews; Günter Strack; Wolfgang Kieling; Lila Kedrova. Dead Again – USA 1991 Directed by: Kenneth Branagh. Starring: Kenneth Branagh; Emma Thompson; Derek Jacobi; Hanna Schygulla; Robin Williams. Un film d’amore sotto mentite spoglie. Nel 1944, nel pieno della Seconda Guerra Mondiale, David O. Selznick ebbe l’idea di assegnare ad Alfred Hitchcock, il regista Britannico con cui aveva siglato un contratto settennale nel 1939, il progetto per la realizzazione di un nuovo film di spionaggio ispirato al racconto di John Tainter Foote, The Song of the Flame (alcune fonti lo titolano The Song of the Dragon), publicato da The Saturday Evening Post nel 1921. Hitchcock e lo sceneggiatore Ben Hecht decisero di conservare di quel racconto l’unica cosa che interessasse realmente al regista, la storia di una ragazza che va a letto con una spia per ottenere importanti informazioni, aggiungendo come Mac Guffin (il “pretesto” attorno al quale gira la storia di spionaggio) alcune bottiglie di vino contenenti una specie di sabbia di uranio custodite nella cantina di una grande casa, quanto bastava per mettere insieme uno dei più famosi film di Hitchcock che uscirà nelle sale un anno dopo la fine della guerra nel 1946: Notorious-L’amante perduta. Secondo quanto racconta Hitchcock nel libro-intervista di Francois Truffaut, l’idea di usare come Mac Guffin dell’uranio nascosto in quelle che sembrano innocue bottiglie di vino custodite in casa Sebastian gli era stata suggerita, un anno prima dello sgancio della bomba atomica su Hiroshima, da un amico molto ben informato sui possibili impieghi di quel materiale, ma fu un altra idea, quella di andare insieme a Ben Hecht al California Institute of Technology in cerca di informazioni sulla bomba atomica ad attirare, a quanto pare, l’attenzione dell’F.B.I (in effetti il suo poteva apparire come un comportamento decisamente sospetto in tempo di guerra) mentre le continue discussioni con Selznick sulla scarsa plausibilità di una cosa come una bomba atomica finirono con l’esasperare i suoi rapporti col produttore che, sempre secondo Hitchcock, un paio di settimane dopo l’ennesima disputa rivendette l’intero progetto alla R.K.O, garantendosi però il 50% dei profitti finali del film (di fatto Selznick all’epoca era completamente assorbito dalla produzione di Duello al Sole e non era interessato ad un film diretto da un regista che sfuggiva sistematicamente al suo asfissiante controllo). Ironicamente, per Hitchcock quel Mac Guffin che aveva causato tanti problemi non aveva nessuna importanza (come del resto dovrebbe accadere per qualsiasi Mac Guffin che si rispetti): Notorious era soprattutto una storia d’amore maledettamente complicata. Infatti il vero motore della storia è l’amore e non certo l’uranio. Alicia, quando capisce quale sarà la sua missione, accetta di portarla avanti non per senso del dovere verso il suo paese ma per amore di Devlin, perché farebbe qualsiasi cosa pur di fargli scordare la ragazza sbandata che ha conosciuto a Miami, perché è disperatamente in cerca della sua approvazione e anche perché aspetta invano che lui le dica che quello che ha fatto è abbastanza e che finalmente ha capito che anche lei a modo suo è una brava ragazza. Ma Devlin non interviene mai, nemmeno quando Sebastian le chiede di sposarlo. Preferisce farsi influenzare dai suoi pregiudizi perché non può permettere che l’amore, per di più per una giovane ubriacona figlia di un nazista, intralci la sua missione: lui è un duro, non trema e non si ferma davanti a niente e anche se quello che deve fare non gli piace (e si capisce quando a un certo punto la difende di fronte ai suoi capi che parlano di lei come di una donnaccia), lo fa lo stesso. Incredibilmente però, specie se si pensa che il film è stato scritto a guerra in corso ed è uscito nelle sale americane nell’Agosto del 1946, la figura più tragica del singolare triangolo amoroso raccontato in Notorious, non è quella di Alicia, ma quella di Alex Sebastian, uno che se non fosse un nazista, farebbe quasi pena. Non solo è il classico uomo di mezz’età, per di più bruttino e piccolo (la differenza di altezza tra Rains e la Bergman ha creato qualche problema “tecnico” durante le riprese), che perde la testa per una donna giovane, bella e pure alta facendosi delle illusioni sul fatto che lei lo ricambi con trasporto, il poverino è anche afflitto da una madre invadente, opprimente e possessiva che lo tratta come un ragazzino e che, da vera strega, quando finalmente lui si toglie le fette di salame dagli occhi e scopre che la moglie è una spia, con freddezza (“siamo protetti dall’enormità della tua stupidità” dice amorevolmente a quello scemo di suo figlio) architetta il piano per eliminarla restituendo a lui una certa dignità nel suo ruolo da cattivo e a noi la possibilità di odiarlo e gioire per la brutta fine che sicuramente farà dopo che sullo schermo sarà comparsa la scritta The End (o almeno per sentirci moralmente giustificati nel farlo). Se ancora vi state chiedendo perché dovreste vedere un film in bianco e nero uscito nel 1946, sappiate che, seppur escluso dalla lista dei “50 Migliori film di tutti i tempi” pubblicata lo scorso anno da Sight and Sound (che vede al primo posto La Donna che visse due volte), Notorious-L’Amante Perduta è al primo posto nella “Classifica dei Film di Hitchcock che io preferisco”, nonché in quella dei “Miei film preferiti di tutti i tempi” ed, in ogni caso, è uno di quei film che dovreste vedere almeno una volta nella vita. Mata Hari – USA 1931 Diretto da: George Fitzmaurice. Con: Greta Garbo; Ramon Novarro; Lionel Barrymore. Gilda – USA 1946 Diretto da: Charles Vidor. Con: Rita Hayworth; Glenn Ford; George Macready; Joseph Calleia. Il 13 non risponde – USA 1947 Diretto da: Henry Hathaway. Con: James Cagney; Annabella; Richard Conte. 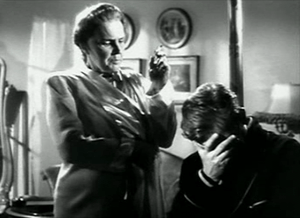 Il Terzo Uomo – UK 1949 Diretto da: Carol Reed. Con: Joseph Cotten; Alida Valli; Trevor Howard; Orson Welles. Indiscreto – USA 1958 Diretto da: Stanley Donen. 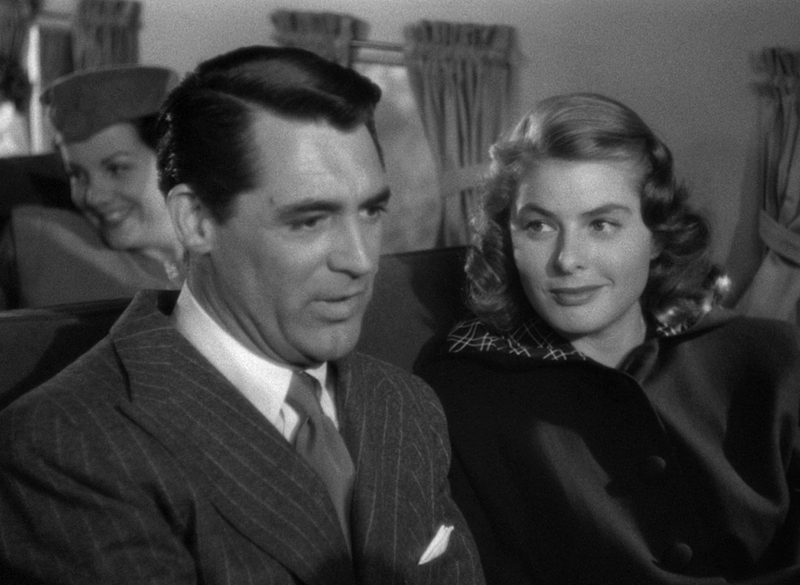 Con: Ingrid Bergman; Cary Grant; Cecil Parker; Phyllis Calvert. Intrigo Internazionale – USA 1959 Diretto da: Alfred Hitchcock. Con: Cary Grant; Eva Marie Saint; James Mason; Jessie Royce Landis; Martin Landau. Il Sipario Strappato – USA 1966 Diretto da: Alfred Hitchcock. Con: Paul Newman; Julie Andrews; Günter Strack; Wolfgang Kieling; Lila Kedrova. L’Altro Delitto – USA 1991 Diretto da: Kenneth Branagh. Con: Kenneth Branagh; Emma Thompson; Derek Jacobi; Hanna Schygulla; Robin Williams. Posted by Ella V on 07/09/2013 in Blogging, Cinema, Movie, Movies and tagged 13 Rue Madeleine, Alfred Hitchcock, Cary Grant, Claude Rains, David O Selznick, Dead Again, Gilda, Indiscreet, Ingrid Bergman, Marnie, Mata Hari, North by Northwest, Notorious, The third man, Torn Curtain. 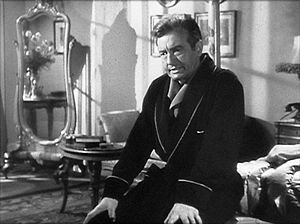 I love this movie and Claude Rains is outstanding in it. He actually makes me feel sorry for him! The most incredible thing is that you almost forget he’s a nazi. e che ne dici della tazzina di caffè? Reblogged this on Ice Mountain Pictures. I’ve never had the chance to see this film, but I have seen Hitchcock’s “Spellbound”, which you also mentioned. I need to see this movie after your post, but what did you think about “Spellbound” by Hitchcock? I love Hitchcock’s movies but, alas, Spellbound ain’t in my top five (in fact also Vertigo ain’t in it, but after all I’m not a film critic, only someone who has seen lots of old movies and love them). It’s surely worth watching, and not only for the famous Dalì sequence, but in my opinion between Bergman-Peck there ain’t the same chemistry Bergman-Grant share in Notorious and probably that’s the reason why I always feel that there’s something missing in this film. Sadly, I’ve only had the luxury of only seeing two Hitchcock films (“Psycho” and “Spellbound”). I hope to see more from Hitchcock in the future, whenever I get the chance. The Dali sequence and the skiing sequence are my two favorite parts of the film. I know some people who thought the skiing sequence was odd, but I thought it was an interesting way to trigger a memory from the past. Which Hitchcock movies would you recommend taking a gander at? I think you could start with Rear Window (a film often cited in other movies), or with Shadow of a doubt, the film Hitchcock preferred (he infiltrates the evil in a sort of Frank Capra’s movie, simply great). If you liked the skying sequence and the Dalì sequence in Spellbound probably you would like Foreign Correspondent a funny spy movie (and also a clever propaganda movie) with windmills used to make signals, assassination under the rain and the most spectacular plane crash. 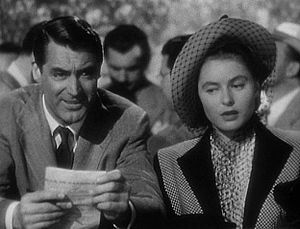 But I think you could also watch Rebecca, Marnie, North by northwest, Sabotage, The Lady vanishes, The Birds, Lifeboat, Vertigo… almost every Hitchcock film is worth watching (only avoid Topaz). Have fun. Thanks for the suggestions. Now…to find time to watch some of these.